“Pay to Protest” Regulations in America: Charging Fees to Protest on Washington’s National Mall? Overseen by the National Park Service, Washington’s National Mall is included in the US National Register of Historic Places. It’s one of many districts, sites, buildings, structures, and objects in the country deemed worthy of preservation for their historic significance. 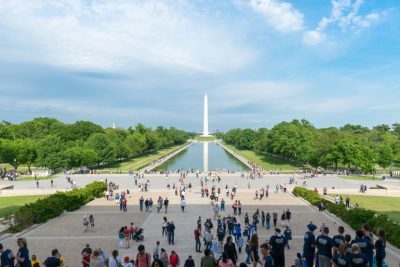 It’s located between the Lincoln Memorial and Washington Monument, Capitol Hill a short distance away. On August 18, 1963, Martin Luther King delivered his famous “I Have a Dream Speech” on the steps of the Lincoln Memorial to a crowd of around 250,000 assembled on the mall, one of the largest political rallies in US history. Palko v. Connecticut (1937), Texas v. Johnson (1989), and other Supreme Court rulings affirmed the same principles. Speech, media, and academic freedoms, along with peacefully assembling to express them are inviolable. Compromising them threatens their loss. Losing them jeopardizes all other rights, what tyranny is all about. The Trump regime’s National Park Service may alter First Amendment rights by charging fees for groups wanting to hold protests or other demonstrations on and around the National Mall – unprecedented if instituted. Restricting public demonstrations on sidewalks in front of the White House and Trump’s Washington hotel may also be imposed. Draft “Pay to Protest” regulations are open to public comment until October 15. “This is a bold effort by the Trump administration to burden and restrict access to public spaces for First Amendment activities in Washington. If enacted, it would fundamentally alter” the most fundamental of all constitutional rights. They include unrestricted freedom of expression and peaceful assembly. The executive, Congress, and courts, are obligated to respect, protect, and preserve them, including in national parks and other public spaces nationwide. Louisiana’s “critical infrastructure” law criminalizes what it calls “unauthorized entry” onto a pipeline site. Individuals convicted face up to five years in prison. Similar Big Oil-backed laws were enacted in Oklahoma and Iowa. They’re under consideration in Ohio and Pennsylvania. Following months of Standing Rock anti-Dakota Access Pipeline demonstrations in 2016 and 2017, seeking to protect sacred Native American land and waterways, North Dakota enacted new laws, prohibiting what it calls riots, criminal trespass, and wearing face coverings. A Missouri enacted law greatly restricts the right of public union employees to strike or picket, undermining fundamental labor rights, as well as free expression and peaceful assembly. Pending legislation in Virginia, Massachusetts, Illinois, and elsewhere aim to criminalize these and similar rights. At the federal, state, and local levels, America is on a slippery slope toward full-blown tyranny. Abolishing, jeopardizing, or otherwise compromising fundamental constitutional rights is what totalitarian rule is all about.